A quick and easy solution to the old problem of forgetting to turn your headlights off. With this circuit, your light switch will receive power only when the key is turned on. So even if you forget to turn the switch off, simply removing the key from the ignition will prevent your battery from going dead. It took about 10 minutes and $8 to do this from scratch, including the relay for the running lights to take the load off of the switch. I already had installed relays for the high and low beams, triggered by the original headlight wiring, and fed directly from the alternator. Drawing power off the white wire or the white wire with the green stripe is optional. White is ignition, and white/green is the accessory circuit for the wipers and heater fan. On my car, I chose the white ignition wire simply because there was a spare female socket to plug a male bullet connector into, so the original wires are completely undamaged. Only enough current to run the relays will be drawn off of this circuit, and the main power for the running lights will still come from the brown battery circuit, through the relay, instead of through the light switch. Important Note: It is mandatory to install additional relays on the headlight circuits (high and low), otherwise this modification would cause your headlights to draw all their power through your ignition switch, and that could possibly be dangerous. Adding headlight relays with this setup is REQUIRED. 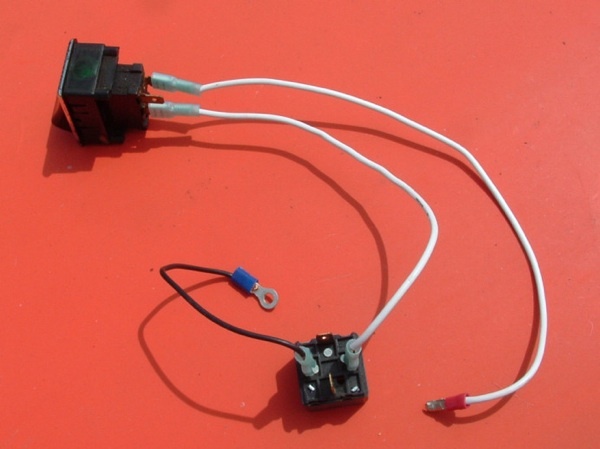 If you do not want to install headlight relays, these wires can be rearranged to place the relay in line with the brown wire going to the headlight switch. In that case, feed the ignition wire to #85. Leave the red wire connected to the light switch #3. Run the short jumper wire between #30 and #2. The disadvantage to doing it this way is that the running lights will still draw power through the light switch. Comments on "Never Leave Your Lights On Again"
I just want to clarify that this circuit requires that headlight relays must be used, else the headlights will draw power through the ignition switch. Drawing power off the white wire or the white wire with the green stripe is optional. White is ignition, and white/green is the accessory circuit for the wipers and heater fan. Only enough current to run the relays will be drawn off of this circuit, and the main power for the running lights will still come from the brown battery circuit, through the relay, instead of through the light switch. 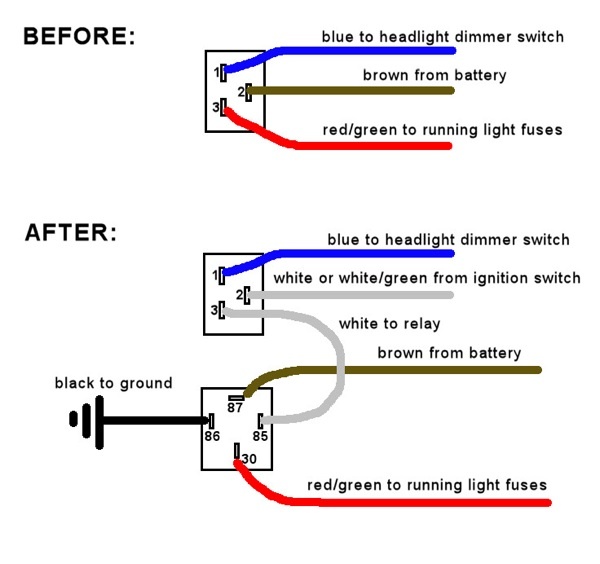 I recommend to install additional relays on the headlight circuits (high and low), otherwise this modification would cause your headlights to draw all their power through your ignition switch. It will be great to show the schematic as it is simpler to determine what is doind what. Also, to what cars does this design apply? or do you mean the dip switch? Yes, what we call a dimmer switch is what you call the dip switch.